AHMEDABAD: Japan's Prime Minister Shinzo Abe on Thursday inaugurated India´s first bullet train project - a $19 billion line in the home state of Indian leader Narendra Modi intended to revitalise the country´s vast but dilapidated network. The initiative is seen as emblematic of fast warming relations between New Delhi and Tokyo, who are seeking to combat China´s growing influence. It is also a new beginning for a rail transport system plagued by accidents and chronic delays. The line, using Japanese trains and technology, will link Ahmedabad to India's financial capital Mumbai and is scheduled for completion by the end of 2023. The 500-kilometre journey will be cut from eight hours now to just over two hours when services start. "It marks the beginning of a new chapter in ties between India and Japan." Abe's visit comes just after a border standoff between India and China in a disputed and strategically important Himalayan area. The two prime ministers both hailed the strengthened ties between their countries. "The Indo-Japan relationship is not just about bilateral trade. It has developed into a strategic and global partnership in the Indian-Pacific region," said Abe. Modi has pledged to invest billions of dollars to modernise India's creaking railway system that remains the main form of travel for millions. The bullet train is one of his pet projects. "Today India has taken a giant step in fulfilling a long cherished dream," Modi said to loud cheers from the audience. "The bullet train project will bring great speed, great development and great technology to the country." The new train with a capacity to carry 750 passengers is a bright spot for the world's fourth largest network by track length. Much of it dates from the British colonial era however. More than 22 million passengers commute daily on some 9,000 trains across the network despite frequent accidents and delays. Trail derailments have already killed more than 200 people this year, including one last month in which 23 died in northern Uttar Pradesh state. Japan is a pioneer in high-speed rail networks and the project is a joint venture between Indian Railways and Japan´s Shinkansen Technology. Japan proudly hails its ultra-efficient Shinkansen for its punctuality and zero-accident record. The train has a top speed of up to 350 kilometres an hour - more than double the maximum speed of the fastest ones operating in India. Japan, which is providing 85 per cent of the cost of the new train link in soft loans, will also facilitate the transfer of technology through training of local engineers. 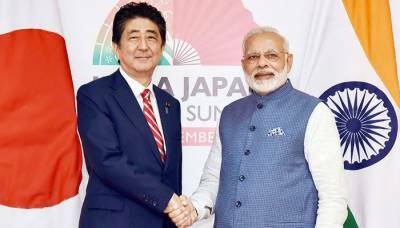 The two leaders are also tipped to sign several bilateral agreements at the annual India-Japan summit later Thursday. The aircraft is expected to boost India´s maritime capabilities against a more assertive China. On Wednesday, Modi welcomed Abe at the airport with his traditional big hug before the Japanese premier and his wife changed into Indian dress. The leaders are known to share personal camaraderie that has accelerated crucial ties between two of Asia´s biggest democracies.